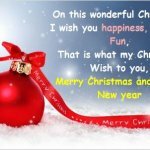 Christmas is here with us again and one of the best things we do in Christmas season like this is to remember our love ones with our Christmas greetings messages for friends and family. It is an opportunity to wish them well for the Christmas and the coming New Year. 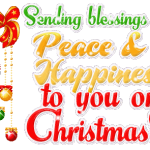 So, I have selected some Christmas greetings messages for friends and family you can just start sending them to anyone you desire to send them to right away, wishing them lots of good things during the Christmas season and beyond. 1. 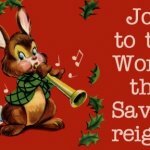 A song was heard at Christmas. To wake the midnight sky. A savior’s birth, and peace on earth & praise to God on high. 2. 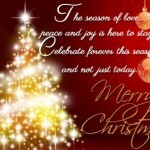 Celebrate this Christmas with all your near and dear ones. Let them all know how much you love and care for them. Party with whistles, music and dance. Have a Merry Christmas. 3. Christmas is a necessity. There has to be at least one day of the year to remind us that we’re here for something else besides ourselves. 4. Christmas is a necessity. There has to be at least one day of the year to remind us that we’re here for something else besides ourselves. 5. Christmas waves a magic wand over this world, and behold, everything is softer and more beautiful. 6. From a commercial point of view, if Christmas did not exist it would be necessary to invent it. 7. Hope your holiday is great and your New Year a prosperous one. 8. I will honor Christmas in my heart, and try to keep it all the year. Gifts of time and love are surely the basic ingredients of a truly merry Christmas. It is Christmas in the heart that puts Christmas in the air. 9. If there is no joyous way to give a festive gift, give love away. 10. Joy resounds in the hearts of those who believe in the miracle of Christmas! 11. May all your days be merry and bright and may your Christmas be white! Merry Christmas! 12. May Christ bless you with all the happiness and success you deserve! Merry Xmas! 13. May joy and happiness snow on you, May the bells jingle for you, and May Santa be extra good to you! Merry Christmas! 14. May the good times and treasures of the present become the golden memories of tomorrow. Wish you lots of love, joy and happiness. MERRY CHRISTMAS. 15. May the spirit of Christmas bring you peace. The gladness of Christmas give you hope. AND The warmth of Christmas grant u love. Happy Christmas. 16. May this Christmas be so special that you never ever feel lonely again & be surrounded by loved ones throughout! 17. May your Christmas sparkle with moments of love, laughter & goodwill. And may the year ahead be full of contentment & joy. Have a Merry Christmas. 18. Merry Christmas. I wish you get everything in your life be happy healthy forever. Lots of best wishes for you. Forever enjoy. 19. Peace on earth will come to stay, when we live Christmas every day. 20. The earth has grown old with its burden of care, But at Christmas it always is young. 21. This Christmas, may you and your family be blessed by God. 22. May baby Jesus reign in your hearts forever. Merry Christmas. Merry Christmas to the sweetest child on this planet. 23. To a joyful present and a well-remembered past. Best wishes for Happy Holidays & a magnificent New Year. 24. 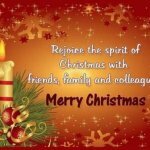 To wish you all the joy of Christmas and happiness all through the New Year. 25. Wishing you all the peace, joy, and love of the season! Season’s Greetings! By now, I hope you’ve been able to send as much Christmas greetings messages for friends and family as you like. If you still want more of Christmas greetings messages for friends and family, please check the related post below. Don’t forget to give my facebook fan page a like using the icon below. Merry Christmas and Happy New Year in advance.